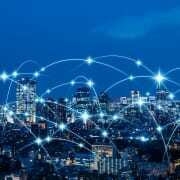 A smart city is essentially the term given to a metropolis that gathers data via electronic data collection sensors with the aim of managing assets and resources efficiently. The benefits to residents that smart applications can provide are widespread, from transportation to health and public safety. The IESE Business School in Barcelona has released the data for the world’s smartest cities for 2018. It might surprise you to know London holds second place only to New York and actually took the top spot in 2015. London’s innovative Oyster and contactless card ticketing system which has revolutionised how Londoners and visitors get around the city since it was introduced in 2003. How do smart cities work? By integrating information and communication technology (ICT) with physical devices which are connected to the network (the Internet of things or IoT), the city can be monitored and the efficiency of operations and services optimised. Emerging trends such as the Internet of Things, blockchain, artificial intelligence and digital twins are driving smart city adoption. These trends are just an example of how big data coupled with information technology can generate streams of valuable data. The primary objective of a smart city is to boost the quality and performance of services and improve business and resident’s quality of life via smart technology. According to Visual Capitalist ( https://www.visualcapitalist.com/anatomy-smart-city/ ) globally, there are 1.3 million people moving to cities each week – and by 2040, a staggering 65% of the world’s population will live in cities. With this in mind it is essential that cities become “smart” to preserve sustainability and efficiency. https://www.espida.co.uk/wp-content/uploads/2019/03/Smart-city-medium.jpg 836 1254 Katie Mansell https://www.espida.co.uk/wp-content/uploads/2017/08/eSpida_log_nobg-300x138.png Katie Mansell2019-03-13 16:36:512019-03-13 21:21:14Smart Cities: What are they? How do they work? Why are they required? A Virtual Desktop Infrastructure (VDI) boot storm is the loss of service that ensues a simultaneous start-up and shutdown of a large number of virtual desktops, which overwhelms the network with data requests and typically creates a “storm” that cripples legacy system storage. A typical office working day sees employees logging on to the system at around 8:30am and off at roughly 5:30pm. A typical server can handle usage throughout the duration of the day. However, the issue occurs when too many virtual desktops are booted up within a short period of time, for example between 8:30am and 9am. This commonly unavoidable synchronised start up overpowers the systems resources and storage, leaving users unable to fully access the system until there are enough resources made available. Whilst a boot storm can be highly damaging to a VDI environment; draining performance and hindering productivity, it can be prevented with the correct solutions within the appropriate architecture, especially if storage requirements are measured and allocated to both average and peak requirements. This ensures your “sums” are correct during the design stages. Don’t be fooled with the illusion that increasing your volume of storage will resolve boot storm problems. Typically, this is just one of several elements of VDI delivery that is given inadequate consideration and adds little value; not only to the user experience, manageability and flexibility, but also ultimately to any ROI & TCO attributes. Widely it is ineffective and can be a costly mistake. The most basic way to prevent a boot storm is to stagger the start-up times of virtual machines or set timed start-ups for before employees arrive to work. This can be set up from several user templates and can be broken down into various user types, for example, power users, standard users and basic users. Depending upon your business needs, the appropriate users’ templates could be ready and waiting to be accessed. However, controlling when users can bootup a desktop VM can be difficult. As today’s technology reflects end-user expectations of a near instant response time from desktop and application availability, affordable options exist to relieve the performance issues that previously affected VDI implementations. When deploying VDI technology, it is critically important to qualify end user computing resource requirements to support and ensure optimal end user experience. Miscalculations at this early stage can denote the difference between a successful and optimised desktop implementation and a failed project. A common solution to the boot storm is to issue persistent desktop images, also referred to as a one-to-one desktop deployment. A persistent desktop image gives each user a consistent, single desktop image with a desktop profile, together with the company’s common applications and user-specific applications. When persistent desktops are set up for timed “wave” boot up, the boot storms that occur when the majority of users show up for work and initiate their VMs can be avoided. However, the administrative overhead of persistent desktops is almost as painful as managing each individual user’s laptop and desktop. Thankfully, advances in technology make non-persistent desktop images, which are refreshed and ‘wiped-clean’ daily once restarted, a more practical and preferable option. A non-persistent desktop image is a clone of a master image called a template. Upon desktop initiation each user receives their dedicated template of the master image which is paired with the user’s individual profile, presenting them with their applicable services and applications. Software providers can provide caching technologies such as image “warm-up” and boot waves to prevent non-persistent desktop boot and logon storms. Shared image bits can be cached for quick access leaving only the user’s unique profile requiring minimal movement from the storage disk area, whilst correspondingly reducing the CPU cycles spent waiting for disk I/O. Common applications are kept in memory along with the standard desktop image which boosts initial start-up performance even further. Even with a number of fixes available, at times the only way of resolving a boot storm issue is via a hardware upgrade, particularly if the current equipment is very old or if the business has experienced growth and it can no longer cope with the demands of the organisation. If a hardware refresh is a concern to the business, for example due to cost considerations or a lack of understanding, then Cloud computing could be an alternative option. You can read more on cloud computing in our forthcoming cloud blog, coming soon. If you are experiencing boot and/or logon storm issues or problems with system speed in general, eSpida can assess your IT architecture and help you to improve performance, achieve a fit-for-purpose IT environment that sits in line with your business strategy and truly future-proof your investment. 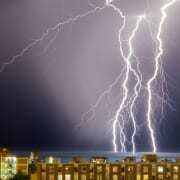 https://www.espida.co.uk/wp-content/uploads/2018/10/Lightening-over-city-min-e1539791531542.jpg 853 1280 Katie Mansell https://www.espida.co.uk/wp-content/uploads/2017/08/eSpida_log_nobg-300x138.png Katie Mansell2018-10-02 11:38:122018-10-02 11:44:55What is a boot storm and why does one occur? 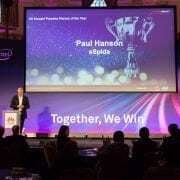 Paul Hanson, Director of Birmingham IT consultancy eSpida, has been crowned Huawei’s presales person of the year at the IT and telecoms giant’s UK enterprise partner summit. The award commends Paul’s enterprise IT expertise and commitment to finding strategic uses for Huawei’s technology to provide value for mid-to-large size businesses across the UK. The award was given in part due to the success of recent projects Paul has delivered with eSpida, for businesses including high street retailer The Works, building materials manufacturer Kingspan and the Birmingham Hippodrome. In the case of The Works, eSpida modernised the company’s IT infrastructure to help the company’s website automate its warehouse operations, improving distribution to its network of over 400 physical stores and improve productivity by 60 per cent. This focus on strategy is indicative of Paul’s view of modern enterprise computing, where he argues that IT is becoming an increasingly valuable resource for businesses rather than just a system to support operations. This philosophy is reflected in the work of eSpida. eSpida is an authorised Huawei Enterprise partner, providing a range of networking, communications, cloud computing and infrastructure services from Huawei’s extensive enterprise portfolio. For more information on eSpida’s award-winning IT consultancy and IT infrastructure solutions, email info[email protected] or call 0344 880 6145. With GDPR now in place, what should businesses consider in order to set good policies around data at the different stages in the data journey, such as when it is at rest, in transit, in the cloud? And what will GDPR mean for this? This blog, from Nigel Crockford, Business Development Manager at IT consultancy and data security specialist eSpida discusses data policies. A good data policy must clearly outline how data will be managed from collection through to storage, with an unambiguous set of procedures detailing how, why and by who. This is necessary for businesses to protect themselves under the new GDPR law. This includes a clear policy on the use of email as a method of storing and moving data. The proliferation of email has meant that it is far too easy to embed malware into an email that will then sit in an inbox for weeks or even months. Organisations should start to adopt policies that take advantage of instant messaging for general peer to peer communications, to minimise the risk associated with over-reliance on email and email security. When multiple people have access to data, which is often the case with information stored in the cloud, there is a greater concern of loss, amendment or handling without necessary permissions. Businesses must have a procedure in place that not only ensures only authorised people directly handle data, but that every person who may process data in some way does so safely. Data loss prevention (DLP) solutions help to form good policy to help identify, report and stop the movement of data in and out of your network. 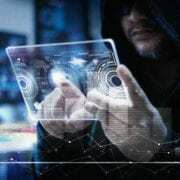 If a person’s device or computer has access to a system that holds data, any viruses that affect it or hackers that attack it can pose a potential risk to data security. It’s crucial that good IT security practice forms an integral part of business culture. The introduction of GDPR has made such policies and best practice even more important. If you feel your business is vulnerable, an IT consultancy offering IT security solutions and services such as eSpida can help. 2017 was the year ransomware hit the headlines hard and it seems the threat is also prevalent in 2018. Security chiefs and CIOs need to be mindful of the risk surrounding their IT systems and data and take a proactive approach to IT security. While we consider today’s attacks, the cyber criminals are 10 steps ahead planning the attacks of the future. So what are the security threats of 2019 that IT professionals should be paying particular attention to? Ransomware exploits vulnerabilities and in today’s business environments, these vulnerabilities often occur as a result of human error. For many organisations, the risk of attack lies with a lack of education among employees about how to manage any information they receive and how this information is collected. The widespread practice of using e-mail in our personal and work lives has made it the instrument of choice for malware attackers. This is because there is an attitude of complacency with regards to receiving e-mails; the sheer volume we receive and send can blind us to the threat of malicious embedded links or attachments that may come from a seemingly innocuous or familiar source. The same is also true of malicious web pages in browsers, as we saw with the recent Coinhive attack. If businesses continue to use mature applications like e-mail to share information and data, then we can expect more businesses to be exploited by Ransomware in the future. Since e-mails are a top target for malware attacks, we recommend that businesses employ instant messaging tools for business communication. SMS technologies like this are particularly effective against ransomware as they limit what your systems can be exposed to, reducing the risk of attack. Rectifying a problem after it has struck in not an effective solution. We must remain proactive and keep cyber crime at bay. eSpida Limited partners with world leading technical brands such as Forcepoint, Huawei Enterprise and WatchGuard to provide best in class IT consultancy and IT security solutions. Do you remember the WannaCry attack from May 2017? How about the NotPetya attack in June 2017? While the WannaCry attack made national headlines, other attacks may have slipped your mind. But the $300 million lost by pharmaceutical giant Merck to NotPetya won’t be forgotten in a hurry. It goes without saying that businesses of all sizes need to be cautious of ransomware, but what should they do when faced with an attack? Featured on Digitalisation World, Nigel Crockford, Business Development Manager of Birmingham based IT consultancy eSpida, explains the steps to take. TheWorks.co.uk is set to continue growth in its ecommerce business as well as the number of physical stores it operates. Following a successful transition to a new IT infrastructure with the help of IT consultancy eSpida, TheWorks.co.uk was able to move to a new head office in Warwickshire at the start of 2017. The success of the project can be viewed in a short film on the case studies page. As part of the milestone move in 2017, eSpida helped TheWorks.co.uk automate its warehouse operations to improve distribution to its network of over 400 physical stores and ecommerce business. The move was managed using a phased transition, which involved all-round upgrades to virtual servers, storage and security, which has subsequently resulted in a 60 per cent improvement in productivity. “Since the project was delivered by eSpida at the start of 2017, we’ve seen some drastic improvements to our business,” explains Tom Scott, IT Director at TheWorks.co.uk. “We’ve been opening one new store per week for the last three years and we needed a new platform to help us do this. 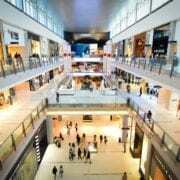 “Our ecommerce business is now handling 30 per cent more transactions like-for-like compared to the previous year. eSpida helped us to make crucial upgrades to our IT infrastructure to improve our capacity and our ability to deliver fast, accurate distribution and stock management to our network of 440 physical stores, up from 280 stores three years ago. “We are now 60 per cent more productive with the same size of team. Where our IT infrastructure team was previously spending 80 per cent of its time on support activities and only 20 per cent on new business development, we’ve been able to flip this so that 80 per cent is now spent on new development projects. Better automation helped to free up much of this capacity. The warehouse, for example, uses an improved order-picking system where the WiFi controlled picking is better managed through handheld terminals. “It’s not always easy for companies to instigate change in their organisation,” explains Nigel Crockford, Business Development Manager at eSpida. “Many companies find it difficult to go from their ‘as-is’ status-quo to their desired ‘to be’ status where they can offer valuable growth and improved efficiency to their bottom line. With the help of eSpida, TheWorks.co.uk has also been able to increase the amount of time available to the IT staff after the day to day running of IT is dealt with, giving them greater proactive management capacity. eSpida has produced a short film about its project with TheWorks.co.uk, which can be viewed at https://www.espida.co.uk/2017/08/14/working-with-infrastructure-specialist/. This video will help anyone considering upgrading their ageing infrastructure and explain how a specialist such as eSpida can help to safely and securely manage this change. The General Data Protection Regulation (GDPR) is being dubbed as “the greatest change in data privacy regulation in over 20 years”. It will replace the Data Protection Act 1998 and comes into play on May 25th 2018. With only a third of businesses said to be currently prepared for GDPR, many organisations are reportedly rushing to hire data protection officers. Whilst companies with more than 250 employees or public authorities are required to appoint a Data Protection Officer; those below the threshold are not obliged to do so. However, all businesses are required by law to comply. When the new regulations are enforced, businesses must have recorded consent before they can use personal data or risk severe penalties. A data breach can result in administrative fines of up to 4% of annual global turnover or €20 million – whichever is greater. So how can technology be used in the quest to become GDPR compliant? Look at the way data flows through your business, review your data model and implement an end-to-end data protection strategy to meet GDPR regulations. • Is it freely available? • Does it contain personal information? Data should be protected by the authority in a data classification system. Encryption translates data into code, so that only people with access to a key or password can read it. At present it is one of the most widely used data security methods in the protection of data and its confidentiality across all devices. By encrypting information, businesses can take control over their data by validating users and ensuring data authenticity when data is used and transferred. Data loss prevention software uses detection techniques to recognise sensitive data. It enables businesses to determine why and how information is being used and therefore identify any data breaches or misuse. It is highly recommended to protect businesses from insider threats. Most standard online security procedures involve a username and password. With the ever increasing level of cybercrime, an extra layer of security is recommended to ensure data is adequately protected. 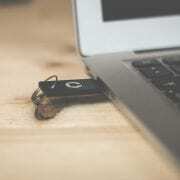 Two-factor authentication, also known as 2FA involves the use of a traditional username and password as well as a piece of information that only the user knows, such as a PIN or fingerprint. With more than half of UK businesses already being affected by Ransomware, it is said to be a case of not IF, but WHEN an attack occurs. This is a scary prospect for any businesses, regardless of size which is why antivirus & anti-ransomware software are so important. By scanning systems, the software wipes out any identified ransomware attempts. 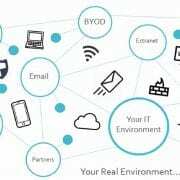 Device Management enables IT teams to control the security, monitoring, integration and management of devices such as laptops, mobile phones and tablets in the workplace to ensure the network and its data is fully secure and GPDR compliant on all devices throughout the business. With the increase in cybercrime coupled with the new laws, data backup has never been more important than it is now. Backups are vital in the event of information being destroyed, be it accidentally or maliciously. An exploit attack is designed to slow down your computer, cause sudden application failure and/or expose your personal data to hackers. Exploit prevention protects the applications and files that are prone to these attacks and cleverly mitigates the methods attackers use to exploit software vulnerabilities. Patch management involves keeping software on computers and network devices up to date and capable of resisting low-level cyber-attacks. With older software versions, companies are far more vulnerable to cybercrime and leave obvious gaps for hackers to intercept. It sounds basic, but the simplest technological solution in the fight against cybercrime is good patch management. By keeping software up to date and capable of resisting low-level threats, businesses are far less vulnerable to cybercrime. For further details on GDPR I recommend visiting eSpida’s dedicated GDPR page where you can find information on preparing your business for GDPR, useful links as well as our ‘Preparing for GDPR’ whitepaper. With cybercrime on the rise, keeping your security strategy up to date is imperative to the protection of your organisation. And with the General Data Protection Regulation (GDPR) May 2018 deadline looming, data security is now critical to legal compliance.